subroutine End the run if the Runner is tagged. I've been using this ICE a lot lately, and it is sweet! NBN getting 2 great new barriers in consecutive packs is kind of bewildering. The stats on this ICE are great. cheap to rez, high strength, it's everything you want in an ICE. I would most likely compare it to News Hound. Same rez, same strength, trace with conditional ETR. I think News Hound is slightly better because currents are more popular than AI right now and Sentry's with ETR's are rare. Nonetheless, this clamps down on the Baba Yaga bullcrap I've had to deal with for a while, as well as other popular AI's like Faust and Atman. Hot Take: This card isn't as good as people think it is. It definitely has it's place, and that is as a solid piece of AI hate and a post-tagstorm taxing tool. Otherwise, the numbers are pretty mediocre - this ends up being a barrier Hunter for 1 credit more, which is not exactly fantastic. Lining up the tag is going to be pretty hard in the first place, and runners are more or less guaranteed to beat the trace running through this. However, against any AI breaker, this is brutal. 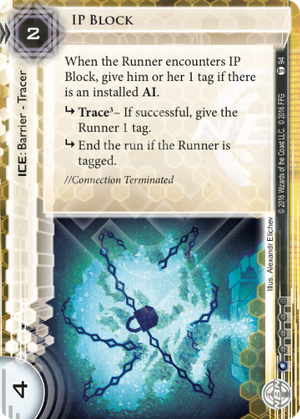 Tag on encounter is dumb, and the ETR suddenly seems a lot more relevant. It's also good once the runner has had like a billion tags get dumped on them to keep them out of servers, but I'd argue that Resistor is much stronger in that role. Ultimately, I think the power of this card is heavily dependent on how much your deck struggles against AIs, as well as how prevalent AIs are in the current metagame.